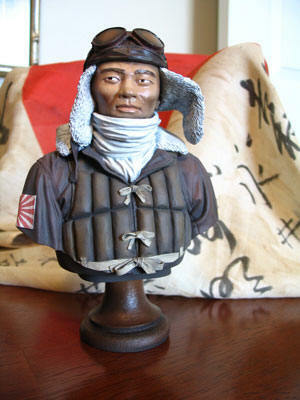 From the late 1930’s until 1942 pilots of the Imperial Japanese Navy reigned supreme over the skies of the South Pacific. Years of rigorous training and schooling coupled with valuable combat experience in the War over China gave these pilots over whelming superiority in the skies of the southern Pacific Ocean during the Great Pacific War. 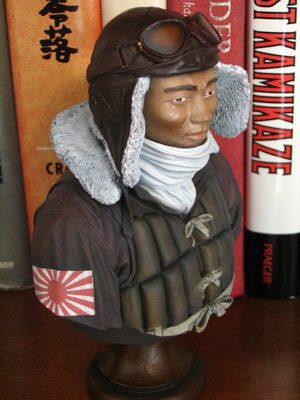 Highly motivated and filled with the spirit of invincibility these pilots of the Rising Sun were seemingly unstoppable! 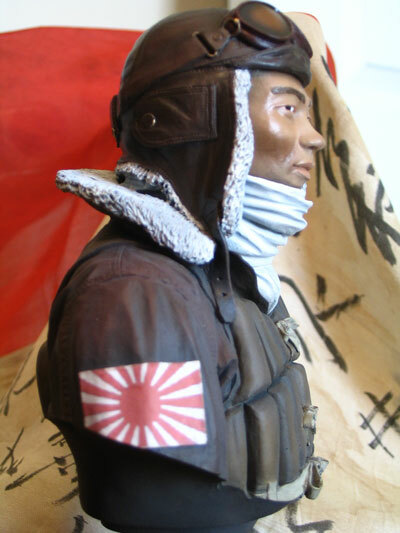 Produced by Verlinden Products, this 1/5 scale bust captures the fighting spirit of the fighter pilots of the Imperial Japanese Navy in the early part of World War Two. The details in this kit are superb and really lend themselves to the creativity of the modeler. The kit is cast in a resin that is very easy to work with as well as paint. There were very few pinholes in the cast and the ones that I found were simple to repair and fill. The figure comes in three pieces. 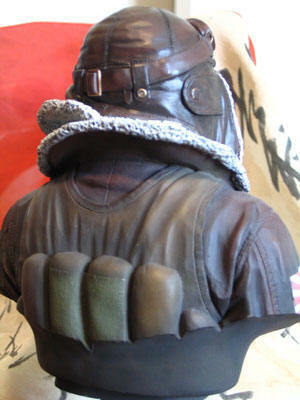 The main body of the figure, the left side flap of the flight helmet, and a nice base. All of the pieces are easy to clean up and fitted together rather well. After removing the flash from the flight helmet flap and sanding down the slightly raised edges here and there, I washed the entire figure with a mild detergent (dish liquid) and water. I let this dry over night. The next day I coated the figure and the base with a primer coat. I used Model Master’s Olive Drab. Looking carefully over the figure I found and repaired the few pinholes in the cast with Elmer’s glue. Letting this dry over a 24-hour period I was ready to begin the painting process. When painting this figure I used various colors and mixes of colors from Model Master’s Acrylic line. I had no problems blending and shading with this product and was very pleased with the results. 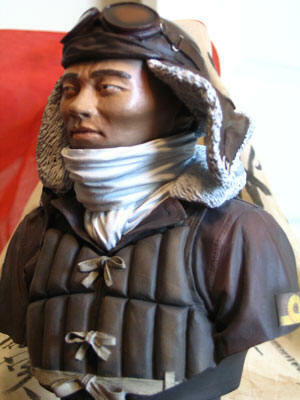 Most of the figure was painted using a Paasche VL airbrush. All of the detail work was done by hand. The details are my favorite part. For me the fine details bring the figure to life. Overall I am very pleased with the outcome of this project and would highly recommend this kit to both the beginner and the experienced modeler. There are no major flaws or drawbacks to this kit. It fits well, painted nicely, and makes an attractive addition to a good friend of mine’s collection! 2. Japanese Naval Aviation Uniforms and Equipment 1937-45. By Gary Nila, Illustrated by Bill Younghusband. Osprey Publishing Elite Series #86 2002. 3. Aviator Uniforms and Equipment of IJN. Model Art Magazine No. 655 All other text is in Japanese, but this magazine/book is a valuable source none the less. 4. 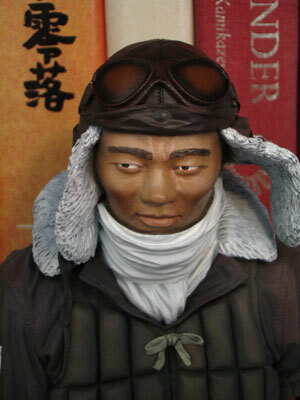 Imperial Japanese Naval Aviator 1937-45. By Osamu Tagaya. Illustrated by John White. Osprey Publishing Warrior Series #55.